How times have changed…..or have they? Imagine a world where healthcare marketing wasn’t regulated – no internal regulatory departments, no PAGB, no MHRA – how much fun could we have? I recently came across a series of health advertisements from years gone by and was slightly shocked, but more intrigued by the content and claims contained within them. In fairness back in 1890, when Dr Batty’s asthma cigarettes were being marketed people believed that tobacco had medicinal properties, although we now know the opposite is true. And the same could probably be said of cocaine – it does have a medical role – but maybe not for toothache, and certainly not for children, as the ad seems to suggest! But is ignorance of possible health impacts due to lack of evidence enough to pretend that these products are ‘safe’? In the early 20th Century tobacco became more regulated as the health impacts became recognized but that didn’t stop the advertising industry using authority figures to help market their products. This all seems like a genuine anathema to us now – we could never contemplate tobacco or cocaine being marketed as something we should consider beneficial for our health. But have we really seen the back of this type of advertising? Over the past few years we have undertaken a lot of work within the nicotine replacement sector and the rise of e-cigarettes has really transformed the landscape. More people are quitting smoking tobacco now through the use of electronic cigarettes, and there is furious debate as to whether they should be available on prescription as a smoking cessation aid. 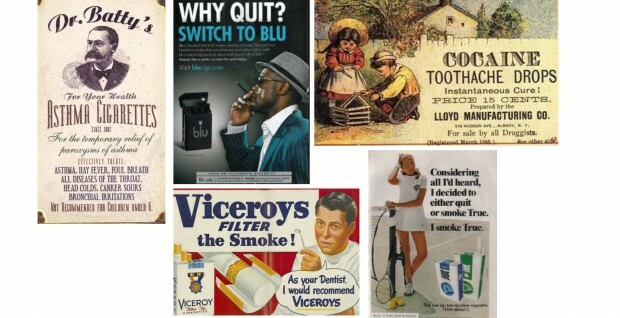 And intriguingly the ad industry has jumped on e-cigarettes as a ‘healthy’ alternative to tobacco, using many of the same techniques deployed when selling cigarettes in the 20th Century before tobacco advertising was banned. But is this the right approach when the longer-term impacts of vaping are yet to be established? Are we risking resurrecting Dr Batty and his curative cigarettes? Should we instead be trying to encourage people to give up nicotine and the hand-to-mouth habit, regardless of whether a cigarette or e-cig is involved? Would love to hear your thoughts on this debate!